Cartoni, an Italian professional camera support company, will introduce several additions to its product line at NAB 2018 Booth C9020. The new fluid heads, tripods, pedestals and remote devices address critical needs of broadcasters, rental houses and independent camera operators. New products include — after the 100mm base presented last year — a new 75mm base Smart Deployment Series tripod and spreader support system for ultra-lightweight cameras. 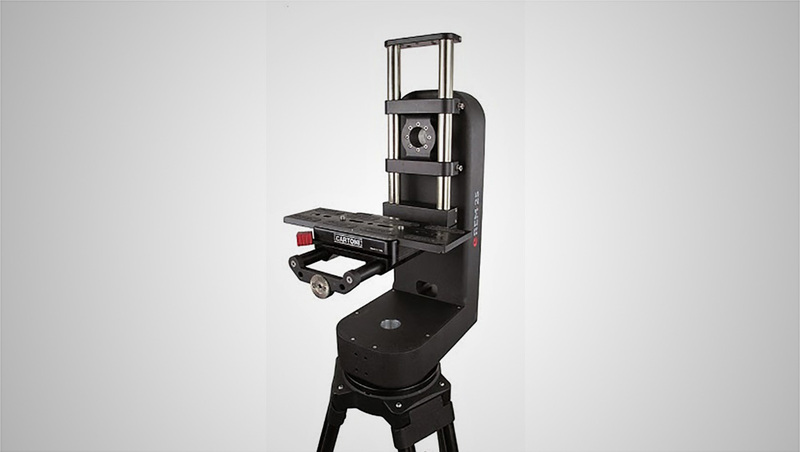 It combines Cartoni’s popular Focus 8 fluid head with a new version of its SDS featuring Cartoni’s Smart Stop two stage and single lever tripod and Smart Lock mid-level spreader technology. Available in aluminium and carbon fiber, the SDS system is super-fast to spread and collapse, making it a perfect choice for ENG, documentaries and other on-the-go shooting. The 75mm SDS system is also available for separate purchase. The new E-Cube 7 is a performing encoded pan and tilt head with 7 steps of drag in both pan and tilt. This fluid head acts as a sophisticated pan bar when connected to a remote head and is the ideal remote control for cameras on cranes, jibs and drones. It features high resolution encoders with accuracy at 40.000 c/t. E-Cube 7 comes with flat Mitchell base and optional 150mm adapter. As the standard E-Cube, with 100mm base and continuous pan and tilt drag, the E Cube 7 can be supplied in 3 different options, with the Cartoni electronics to operate the Cartoni E-REM 25, with encoders only, transmitting position data to any OEM electronics or bare-bone fluid head accepting different encoders and electronics in total OEM configuration. The E-REM 25 newest release showcases an extremely smooth, reliable, silent, remote pan and tilt head with no back-lash. The maximum payload of 56 pounds covers almost all camera and lens configuration in studio, dollies, towers, cranes or pedestals. NewscastStudio presents the latest news, product announcements and reports from the 2018 NAB Show in our special section, brought to you by Leyard and Planar, the leaders in display technology and fine-pitch LED.